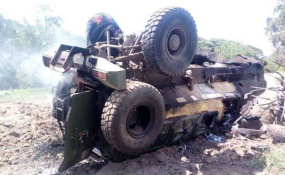 An armoured personnel carrier that ran over an explosive planted by suspected Al-Shabaab militants in Lamu County (file photo). The militants shot the donkeys and abducted two people who were escorting the carts, sources say. Their fate is not known. A resident in Wajid town who did not want to be named for security reasons told VOA that militants set fire to the goods and carts. The donkey carts were carrying sugar, rice and flour to Wajid, residents say. Al-Shabab has imposed a siege on several towns controlled by Somali government and African Union forces in an effort to force residents to vacate towns as part of their economic war. Wajid was seized by AU and Somali troops in March 2014. The only way to transport goods to Wajid and several other towns has been to use donkey-carts to smuggle items. The Somali government and African Union Mission (AMISOM) have vowed to end the siege, but several towns in Bakool, Bay, Hiran, Galgudud and Hiran regions continue to be surrounded by the militants.